On Wednesday afternoon Sacramento Sheriff’s deputies arrested 18-year old Shakeel ALI-MAPP, hours after he fled from officers and led them on a manhunt in Carmichael. 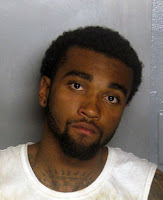 ALI-MAPP was booked into the Sacramento County Main Jail on charges of unlawful possession of a firearm by a convicted felon, unlawful possession of ammunition, and resisting or obstructing a peace officer. At approximately 11:45a.m., Sacramento County probation officers went to the 3300 block of Mensch Court in Carmichael, to conduct a compliance check at ALI-MAPP’s residence. While inside, officers observed a firearm in plain view. ALI-MAPP fled and led officers on a foot pursuit as he escaped through backyards of residences in the neighborhood. Over the next two hours, patrol deputies, K-9 units and probation officers searched the neighborhood but were unable to locate the suspect. During the manhunt, a school in the 3000 block of Garfield Avenue was placed on lockdown as a precaution and to ensure the safety of students and staff members. At approximately 1:35p.m., officers broke down the perimeter while K-9 units stayed in the area, attempting to track the suspect. The school resumed normal operations, and all patrol units ultimately cleared from the area. At 3:55p.m., the Sheriff’s communications center received a call from a resident saying that a male subject matching ALI-MAPP’s description was walking near the 5300 block of Robertson Avenue. The caller stated that deputies had been out in the area earlier, searching for this subject. Patrol deputies and K-9 officers quickly descended upon the scene. At 4:13p.m., with the help of residents in the neighborhood, deputies located ALI-MAPP in the backyard of a residence in the 3000 block of Merrimac Street in Carmichael. ALI-MAPP was taken into custody without incident, and transported to the Sacramento County Main Jail for booking on the aforementioned charges. No Comment to " Suspect's Luck Runs Out in Carmichael "